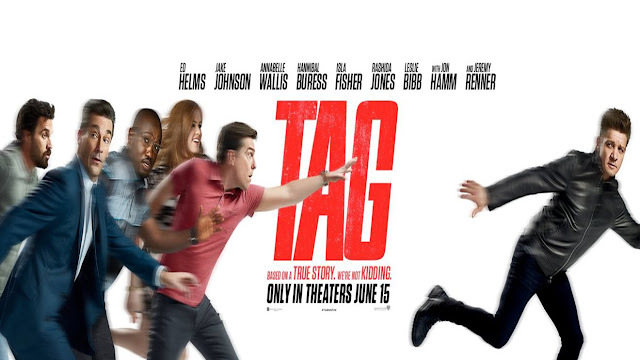 Tag is a 2018 American comedy film directed by Jeff Tomsic (in his directorial debut) and written by Rob McKittrick and Mark Steilen. The film is based on a true story that was published in The Wall Street Journal about a group of grown men, played by Ed Helms, Jake Johnson, Hannibal Buress, Jon Hamm, and Jeremy Renner, who spend one month a year playing the game of tag. Annabelle Wallis, Isla Fisher, Rashida Jones, and Leslie Bibb also star. It was released on June 15, 2018, by Warner Bros. Pictures, received mixed reviews from critics and has grossed $77 million worldwide. "Hogan ""Hoagie"" Malloy, Bob Callahan, Randy ""Chilli"" Cilliano, Kevin Sable and Jerry Pierce have been playing tag since they were nine years old, starting in 1983, during the month of May. Since then, the group’s main rule of the game is that the last one tagged is “it,” until next season. With Hoagie having been the last one tagged in the previous year, he first recruits Bob, the CEO of an insurance company, and then Chilli and Kevin for one last attempt to tag Jerry, who has seemingly never been tagged because of his strong athleticism and intelligence. Hoagie tells them that Jerry plans to retire after this year's game because of his upcoming marriage. Rebecca Crosby, a Wall Street Journal reporter doing a piece on Bob, joins them and decides to write an article on the friends. They are also accompanied by Hoagie's wife Anna. Once they arrive at their hometown of Spokane, Washington, they locate Jerry at the local country club he will be getting married at, but they are overwhelmed by Jerry's skill. Jerry then introduces his fiancee Susan. As the others express disappointment over not being invited to the wedding despite their close relationship, Jerry knew he would almost certainly be tagged or at least targeted during the ceremonies. They agree to not play the game at any wedding-related events in exchange for invitations to the wedding. Despite this, the group makes several attempts to tag Jerry both before and right after wedding-related events. Everyone meets up at the hospital where Hoagie tells them the truth: he had lied about Jerry quitting after the season because he wanted to reunite with his friends after he recently discovered a tumor on his liver and has advanced liver cancer; he may not be alive for the following year. Jerry chooses to swallow his pride and allows Hoagie to tag him. The group starts the game again, running around the hospital as they did as children, and change their rules so Anna, Rebecca, and Susan can play as well. Before the credits roll, multiple photographs and video clips are displayed, showing the real group of ten men that inspired the film, who continue to play to this day."